I've decided to stop eating all meat and eggs. c) I would never in a million years have imagined that in the (chicken) egg farming process, male chicks are gassed to death in something called a dispatching chamber, within a day(s) of hatching. 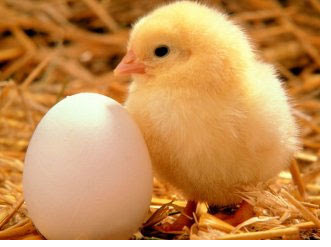 All those adorable little yellow fluff balls are just killed, simply because they're male, and can't lay eggs. To the industry, their lives have absolutely NO value at all. I know this has been the reality for decades and it's naive of me to have never contemplated it before, but actually watching these innocent little creatures so desperately gasping for breath whilst being unknowingly murdered was just too much for me to handle. I just broke down in tears and vowed that eggs and chicken meat would never pass my lips again. I mean, how could anyone kill something that looks like this? Today is my third day as a pescetarian...I hope to continue this way for the rest of my life. I would love to do this too. But I just make sure I eat free range. That's how veal came about too. Male calves are useless in dairy farms so they are usually killed and buried immediately after birth. Then some "genius" decided it was profitable to slaughter the calves and market the meat as veal. Obviously, it got more perverted over the years when ranchers/chefs created "white veal" as opposed to regular pink veal. White veal comes from baby calves that are locked in crates standing up for days so they can't use their muscles and their meat remain white and tender. It fetched a much higher price than pink veal. Never underestimate the ingenuity and cruelty of the human race. Disclaimer: I love hamburger too much to be a vegetarian. But you are right, we need to eat less meat products. BTW, fish aren't that great either. Most farm raised fish are dosed with hormones and antibiotics. Wild fish, especially large ones like tuna, have high mercury content. Pregnant women are warmed against consuming too much wild fish. Yikes, what else is there to eat?!?!? Nice post. I gave up eggs and dairy last year after finding similar info about the male chicks being killed in both regular and free range production.